Although Playmobil has existed for over 40 years, it’s only recently that the toy line has expanded to include licensed properties. That’s not necessarily a bad thing; we just wish the company’s new Ghostbusters line had existed 33 years ago when we were originally obsessed with the movie and desperate for ghost-busting toys as wonderful as these. The original Ghostbusters movie hit theaters way back in 1984, and while plenty of kids convinced their parents to take them to see it, it wasn’t until the animated series premiered two years later that Ghostbusters toys finally arrived from Kenner. However, the animated series was only loosely based on the movie, and featured cartoonish versions of the characters. That influenced the design of the toyline, and because the series had to cook up new plotlines and characters to fill episodes that eventually spanned five years, the original Kenners’ Ghostbusters toy line got a little over-the-top at times. Had I, or other children of the ‘80s been given the choice, we would have surely filled our Christmas wish lists with these new Playmobil sets instead. Admittedly, as with Kenner’s original figures, Playmobil’s Ghostbusters figures bare only the slightest resemblances to the film characters they’re based on. Aside from Winston, you basically have to rely on each figure’s hair styles to tell Egon, Peter, and Ray apart. And despite very limited articulation (it’s Playmobil, after all) the figures do make up for it with lots of wonderful details and accessories like ghost traps, and tiny proton packs. You can’t have Ghostbusters toys without Slimer. 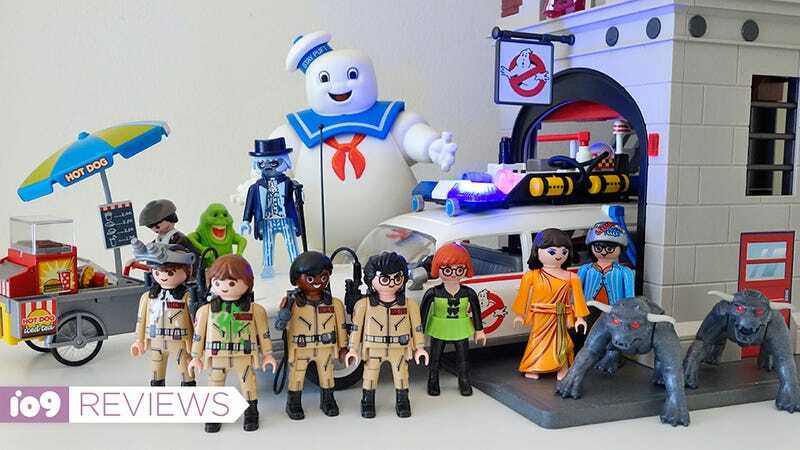 Across six different sets you’ll find most of the important characters from the original Ghostbusters film, including a Playmobil version of Bill Murray (finally! ), the library ghost from the movie’s opening scene, Slimer (attacking a well-stocked hot dog cart), a pair of Terror Dogs, and of course, the Stay Puft Marshmallow Man. Stay Puft has a goofy grin permanently plastered across his face, and of all the figures in the line, he offers the least amount of articulation, only being able to move his arms at the shoulders and turn his hands. Each Ghostbuster comes with a wearable proton pack and wand they can hold. That limits how you can pose the figure, but at least he sufficiently towers over Peter, Egon, Winston, and Ray, so you can recreate the Ghostbusters finale as often as you want without having to worry about getting sticky marshmallow goop all over the place. Where Playmobil’s new line really shines, though, is with its playsets. The towering Ghostbusters Firehouse is permanently cut-away to reveal three different floors full of furniture and accessories you’ll recognize from the movie. And, yes, there’s a working fire pole too. The Gatekeeper version of Sigourney Weaver’s Dana Barrett also comes with a pair of Terror dogs. The main floor garage features the big red containment unit, complete with an opening door and giant activation lever where ghost traps can be emptied. Shutting it down would be a big mistake, but that’s never going to happen because the one character missing from the new Playmobil line we genuinely wish had been included is William Atherton’s Walter Peck. Upstairs is Egon’s lab featuring a collection of miniature ‘80s-era scientific equipment he can use to study the Keymaster version of Rick Moranis’ Louis Tully character. The Firehouse also includes an alternate version of Egon’s figure dressed in a lab coat instead of his jumper. There’s also a third floor that can serve as Janine Melnitz’s reception area. Even with a giant CRT display connected to it, that computer looks a bit too modern for 1984. (A full-color screen?) But that’s easy to forgive when you discover there’s an official Playmobil newspaper headlining the Ghostbusters. The Firehouse even has a working garage door so you can park the best part of Playmobil’s new Ghostbuster line inside: Ecto-1. If you only have the room (or budget) for one of these sets, Playmobil’s new Ecto-1 is the one to get. As we’ve seen with its Porsche toys, Playmobil’s designers seem to be obsessed with accurately recreating cars, and have done a fantastic job at miniaturizing what is probably one of Hollywood’s most famous movie vehicles. If Playmobil wanted to bring us a Back to the Future toyline as well, we’d happily preorder the DeLorean set right now, sight unseen. In addition to working, flashing lights on top, Ecto-1 has another button that activates its distinctive siren, which you can hear here. They’re both powered by a set of AAA batteries, and automatically turn off after 10 or 15 seconds so you’re not swapping those out for a fresh set every few days. That being said, we can’t stop pressing that button. Two buttons on top of Ecto-1 can be used to activate its flashing lights, and distinctive siren. Ecto-1's roof can be removed, letting you fill it with figures and ghost-busting accessories. If you do surrender Ecto-1 to your kids, they’ll be happy to find a lot of extra play value. The entire roof can be easily removed revealing enough room inside to seat four Playmobil characters, as well as places to store their ghost traps and proton packs. The Ecto-1 also comes with Janine in a Ghostbusters uniform, inspired by the second film. Ranging in price from $70 for the Firehouse, to $45 for Ecto-1, to just $8 for a basic Egon Spengler and ghost set, Playmobil’s new Ghostbusters line comes at a weird time given today’s kids are probably more familiar with last year’s remake of the film. Playmobil is clearly targeting the children of the ‘80s who now have kids of their own. It’s easier to justify buying all of these sets when you can convince yourself your kids can play with them too—even if they’re secretly only destined to sit on a shelf in your office.